Are you in a position to bless a person or couple in leadership with some time away devoted to spiritual refreshment or personal growth? Do you and/ or your spouse feel wearied, embattled or overwhelmed by the demands of ministry and need a place `off-site' to sort some things out in privacy and/ or with the assistance of a trained and experienced pastoral counselor? Or do you need a break in routine and want to visit Pa Dutch country with its many attractions and Christian activities (eg. Sight and Sound theater)? We invite you to reserve some dates and enjoy the accommodations at the bed and breakfast. During your stay you can optionally schedule some time with the Healing-Care Counseling Ministry. Work through issues with the help of a caring person who is unbiased and impartial; in confidentiality and safety. Allow God to reveal Himself in new ways, take you to new levels of intimacy and restore the joy of your salvation through His transformational healing power. 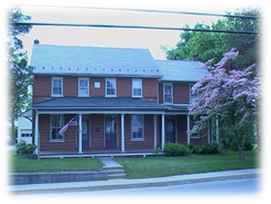 We are located in Millersville, Pennsylvania.